If you watched the Kingsford Invitational you know that part of the competition was the One Bite Challenge. The contestants were allowed five ingredients and one hour to create a signature grilled one-bite entry. Some of we foodies in attendance were interviewed and asked what our perfect one-bite might be. Before I get into the recipe I thought I'd let you know that Grilling.com is conducting a Kingsford One Bite Challenge Sweepstakes. Share your one-bite recipe and have a chance to win a trip to Memphis In May, one of the largest and most prestigious barbecue contests in the country. [In my best TV announcer voice] "We now return you to your regularly scheduled program, already in progress." The base of my entry is a simplified twist on my Slammin' Salmon that I describe in the video. These canapes balance sweet, salt, bitter and umami. 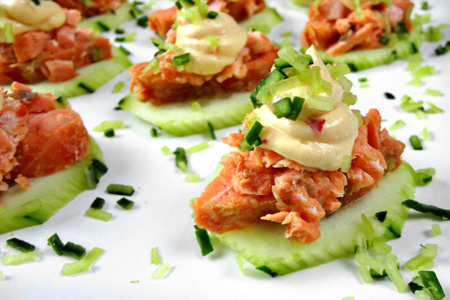 The succulence of the salmon, the crunch of the cucumber and the creaminess of the cream cheese offer a great blend of textures. I always weird myself out when I try to come up with compelling foodie-sounding descriptions. I sound like some kind of Iron Chef wannabe. The bottom line is that these are really balanced and really good. Make some and you'll see. There, that's much more me! Note: You'll also need a new food-safe cedar plank that's large enough to hold the fish with about an inch of margin around the edges. Soak the cedar plank in warm water for one to two hours, making sure that it stays submerged. Combine 1/2 cup of the chili sauce and the hoisin sauce in a small bowl, whisk to combine and set aside. Start your grill and prepare for direct cooking over medium heat (375-400º). Remove the plank from the water and pat dry with paper towels. Place the fish on the plank, skin-side down, and brush the flesh side with a light coating of the chili sauce mixture. Note: If the fillet has a thin tapered belly edge, fold it under so that the fish is of uniform thickness. Put the planks on the grill grate directly over the coals/flame, close the lid, and cook 15 minutes. Brush the salmon with another light coating of the chili sauce mixture, close the lid and continue cooking until the internal temperature of the fish is 145º (10-15 minutes). Remove the plank to a sheet pan, brush the fish with another light coating of the glaze, set aside and let cool. Once cooled, carefully remove the fish from the plank (leaving the skin), wrap in plastic wrap and refrigerate. Note: You can prepare the salmon a day or two in advance. Combine the remaining chili sauce and cream cheese in a small bowl and whisk to combine. Put the mixture into a gallon-size zip-top bag and seal while removing the excess air. Make an improvised (and disposable) piping bag by cutting off about 1/8" of one lower corner of the bag (or insert a standard piping tip), set aside. Peel the cucumbers and reserve the strips of peel from one. Cut the cucumbers on a diagonal into 1/4" slices and arrange them on a large serving platter. Mince the reserved peels to use as a garnish. 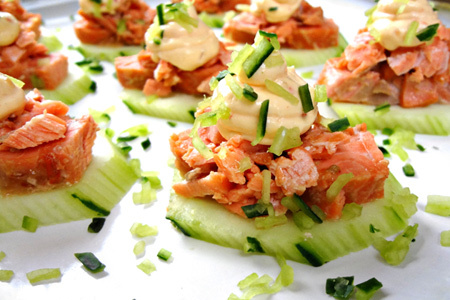 Flake the salmon and put a small mound on each cucumber slice, pipe a dollup of the cream cheese mixture on each, and garnish lightly with the minced cucumber peel. Sounds absolutey delicious! I will be making these. Hailey said these were delicious! Its like sushi only better! Damn John- you really upped your game on this one! I'm impressed! Thanks Robyn! What did you make for your one bite? I would have to say this is the best of the ones that I have seen from the bloggers and better than most at the competition. Thanks so much, Chris. That's very kind and gracious. Your entry looks very tasty. I am so making this recipe this weekend!